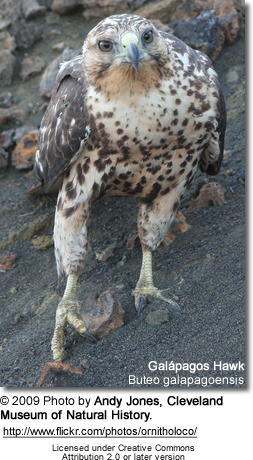 The Galápagos Hawk (Buteo galapagoensis) is a large hawk endemic to the Galápagos Islands. Known for its fearlessness towards humans and authority over the islands as the only original predator, this raptor has inhabited the Galápagos archipelago for over 300,000 years. 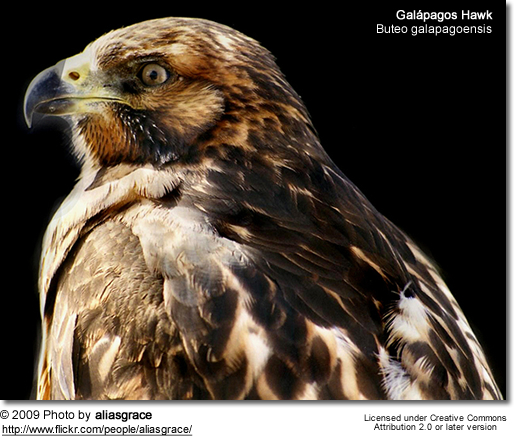 Similar in size to the Red-tailed Hawk (Buteo jamaicensis) and the Swainson's Hawk (Buteo swainsoni) of North America, the Galápagos Hawk is about 55 cm from beak to tail with a wingspan of 120 cm. 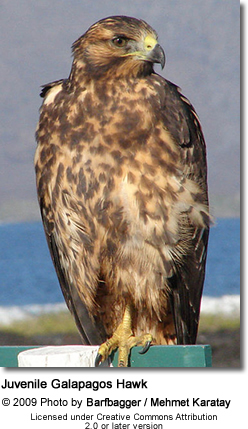 Females are noticeably larger than males as in many species of birds of prey. Mature adults are generally a sooty brownish black with a slightly darker crown. Pale brown, grey, or buff feathers line the edge of the mantle, and the tail is a silvery grey. Their grayish black bill contrasts with a yellow cere, legs and feet. Juveniles are a blackish brown, mottled with buff and white and a black streak extending from the corners of their mouth. Unlike the adults', their bill is blue-grey at the base, their cere a grey-green, and their feet a pale yellow-green. Other than the difference in size, the male and female look quite similar. This hawk lives mainly on insects such as locusts and giant centipedes, as well as small lava lizards, snakes and rodents. It is not uncommon for it to take young marine and land iguanas, and sea turtle and tortoise hatchlings. 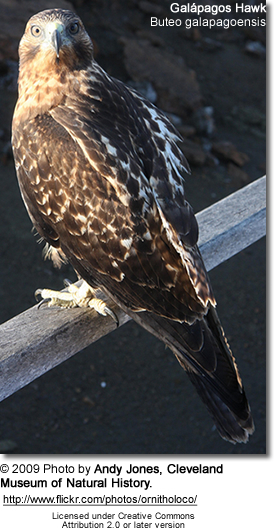 This predator has also been spotted near nesting areas of Fork-tailed Gulls, where it steals eggs as well as young. Even extremely rancid carrion is picked apart by their sharp, forceful beaks. 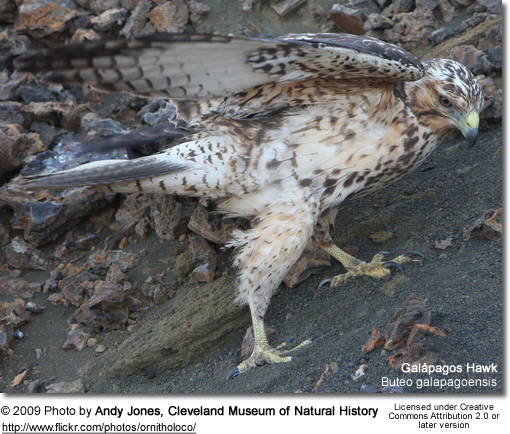 Their feet and talons are also strong like those of the closely related Red-backed Buzzard and White-tailed Hawk. "A gun is here almost superfluous; for with the muzzle I pushed a hawk out of the branch of a tree.."
Because the seasons of the island are unchanging due to the close proximity of the equator, there is no regular mating season. Mating takes place a few times a day on a nearby perch or in flight. It begins when males make fake attacks on the female from behind by dive bombing her, and then the male follows the female as she descends to the trees below. While males tend to be monogamous, the females will mate with up to seven different males during mating season. Throughout the entire nesting period, the female and her males take turns protecting the nest and incubating the eggs, even participating in the feeding. Nests are built low in trees, on lava ledges, or even on the ground at times. Used for many years and nesting periods, they become quite large, sometimes even four feet in diameter. Stick structures are lined with grass, bark, clumps of leaves, or other available soft materials. The mating pair is together the majority of the time at the prime of egg-laying season, and usually stays close to the nesting site. The nest is maintained constantly with fresh, green twigs. Normally one to three eggs are laid, green-white in color, but only one young is reared. Young hawks leave the nest around 50-60s days after hatching. Juvenile hawks will not enter the territorial breeding areas until they reach the age of three, becoming sexually mature. Although these birds are generally fearless, they will abandon their nest if it has been tampered with by humans. 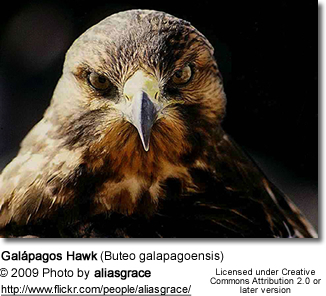 The call of the Galapagos Hawk is a series of short screams similar to the call of the Red-shouldered hawk that have been described as a keer, keeu, or an inflected kwee�. Especially noisy during breeding season, their call softens to a kilp, kilp, kilp. Although the exact number of these birds is unknown, there are believed to be only around 150 mating pairs in existence today. This statistic has improved slightly from past years, but it is far from the abundance they were found in on all the islands of Galapagos when they were discovered. Due to human disturbance to their natural habitat, a dwindling food supply because of new predators introduced to the islands, and predation by humans, they are now extinct on the islands of Baltra, Daphne, Floreana, San Cristobal, and Seymour.